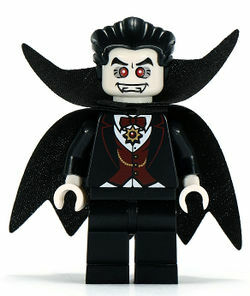 Vampire is a minifigure from 8684 Minifigures Series 2. There was a previously released Vampire from the Studios theme. He comes with many new pieces, including a new cape, face and hair. He also comes with a bat. His hairpiece is the same as the Karate Master, Count Dooku and The Joker. The vampire has unprinted black legs. His torso is black, and printed with a black jacket, a dark red vest and bow tie, a white waistcoat, and a gold pendant. His arms are black, and he has white hands. He wears a tattered and edged black cape. His face is white, and he has a mouth with white teeth in it. His eyes are red with white dots in them, and are surrounded by circles of grey. He has large black eyebrows with a small crease between them. He has slicked back black hair. He comes with a black bat as his accessory. He appears in the video game LEGO Universe as a Paradox vendor named Rutger Hemoglobin. Oddly enough, Rutger claims to be "not bad for over 300", although the Vampire's bio says he is only 200. He is very similar to Lord Vampyre, from Monster Fighters. The Vampire on his base. This page was last edited on 11 July 2016, at 23:50.